In 2010, the U.S. Department of Agriculture revised its guidelines for healthy eating, changing their diagrams from the time-honored pyramid to a simple dinner plate. Now it’s easier than ever to figure out what and how much to eat to achieve a healthy balance. By following the “dinner plate” guidelines, you’ll get all the nutrients you need to stay fit. Dr. Khodadadian recommends choosing proper meal proportions to maintain a healthy weight. 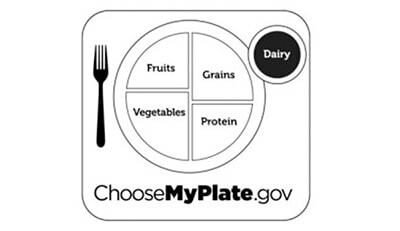 The My Plate diagram removes the guesswork from trying to interpret the food pyramid. If you have high blood pressure, heart disease or any gastrointestinal diseases, book an appointment with your Manhattan gastroenterologist or digestive system doctor about the foods to avoid or redouble to fulfill your daily portions. Basically, divide your plate into four sections with equal amounts of fruits, vegetables, grains and protein, with a side of dairy to round out each meal. Half of your daily intake should consist of fruits and vegetables. A diet rich in vegetables and fruit is great for your digestive health. Consuming fruits and vegetables optimally leads to a healthier body while reducing your risk of stroke and heart attack. Fruits and veggies also are an excellent source of fiber that help prevent constipation. Vitamins and minerals — especially vitamin C, potassium and folic acid — come from a wide range of fruits and vegetables. The grains portion on your plate also provides a good dose of fiber when you fill it with low-fat, nutrient-dense carbs like whole grains, nuts and seeds. For the best choices, stay away from refined grains because the process used to make them removes the best parts. White bread, white rice and de-germed cornmeal, for example, lose dietary fiber, many B vitamins and iron after being refined. Your protein portion can overlap into other sections on the plate. Beans and legumes, for instance, are excellent sources of protein that also fill the vegetable portion of your plate. Typically, they are the food of choice for vegetarians. Seafood, meat, poultry, eggs and processed soy products are other proteins you’ll commonly use to fill the protein section. Choose lean cuts and go for skinless poultry when you can to cut back on fat and calories. At least eight ounces a week should consist of fish. Finally, consider your dairy consumption when planning your daily meals. Children and adults have varying needs of dairy, ranging from two to three cups per day. Milk, cheese, soymilk and yogurt fit the bill. Low fat and non-fat options are ideal too. The My Plate guide for dairy portions only includes those dairy products that are high in calcium, which does not include butter, cream or cream cheese. By choosing the My Plate guidelines, you can prevent stomach pain in New York City, as well as food-related complications like diarrhea, GERD, gas and bloating. Eat the right foods, in right proportions, and you can become — or stay — healthy. The number of calories you consume each day is still important, however, so don’t cheat by using a serving platter. Stick to the dinner plate or better yet: switch to a smaller plate if you’re trying to lose weight. Just keep the portions in proper perspective. Book an appointment with NYC gastroenterologist Dr. Shawn Khodadadian to learn more information on correct meal proportions & eating healthy.